3-When clik manual lookup open search dialog(I complitly delete string for searching,and no meter what to chose from top panel Movie or tvshow alwys is same.Same is when leave Title in serch dialog). 5-for simular name(no in library) only collect for first Title info and art, for rest info is blank and for art working only thumb. I'm sorry but I can't follow this. Please make sure to seperate your questions and not mix them up. That combined with bad English makes it impossible for me to read as English, sorry. 1) The PVR Art function is still not working correctly in your case, it prefers tvshows all the time while it should be movies. 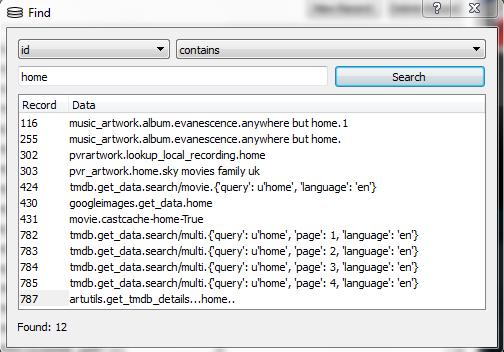 Question a) Can you please check whatever is set in the infolabel $INFO[ListItem.genre] in your case ? Question b) If you chooce "manual lookup" from the context menu, are presented with a dialog to choose if it's a movie or tvshow ? 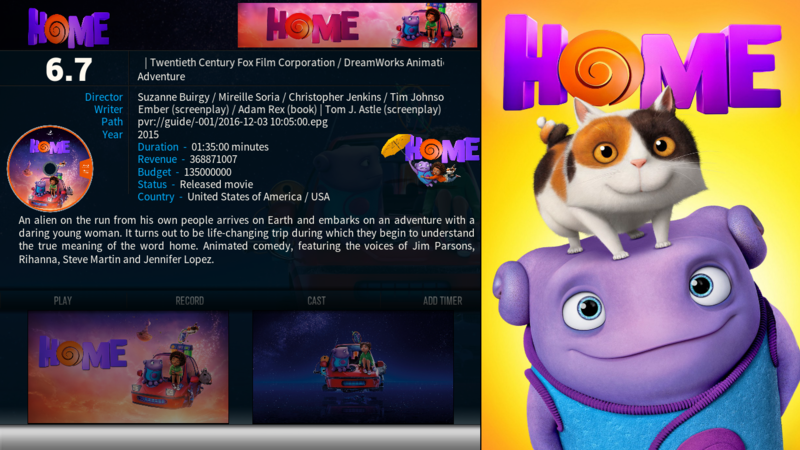 Question c) Do you actually see the "TMDB results" selection box when you do a manual search for PVR artwork ? 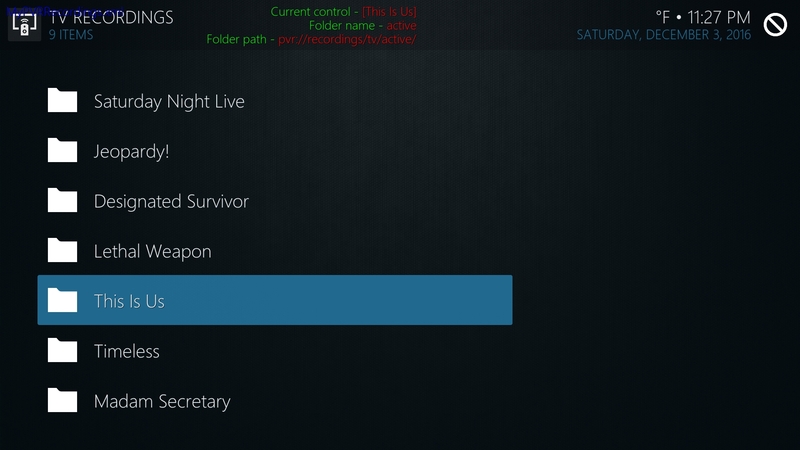 2) The SkinHelper.Pvrbackground doesn't show fanarts from TV channels, only from recordings. Answer: You probably have cleared the cache. Now it will take up to 30 minutes before the backgrounds will start showing. They're lazy loaded in the background to not stress the load too much. The other questions/reports I couldn't make heads or tails about them so please rephrase them more clearly. I write Tarzan english..but I put images to see what I cant explain with word. No worries, it's not my native language too so that makes it extra difficult I guess. Also, please give me the results of $INFO[ListItem.genre] - I know you're not using that but I need to know what it's displaying. 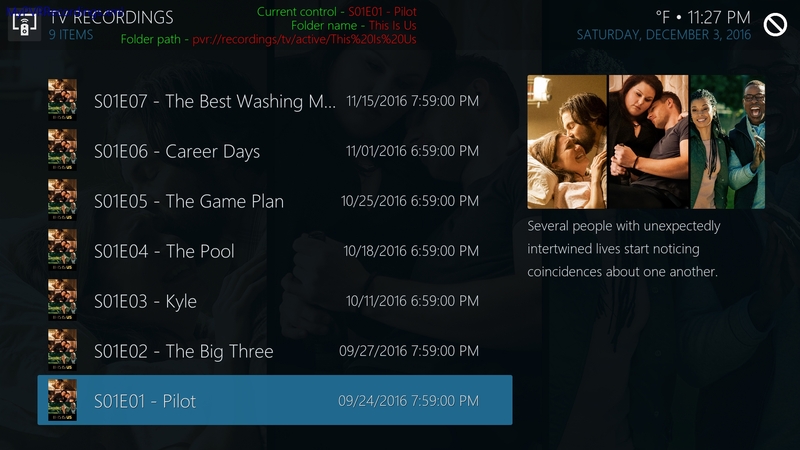 (2016-12-02, 09:15)wheatfield Wrote: [ -> ] Hey Marcel, I've noticed that in PVR recordings, images no longer display at the group folder level. Is this intentional? Thanks. Should still work at the grouped level. Are the groupfolders named like the recordings ? I only got it to work by using manual lookup and ignoring the active filter warning. When the keyboard dialog pops up, it is only displaying the first word of the title, so I type in the rest. I guess I'm not understanding how the filters work. The folders are named like the title of the movie or tv show, though there are episode titles for the actual episode recordings in the folder. EDIT: It looks like artwork will appear inside movie folders (since the file and the folder are named the same), but not episode folders (folder is TV Show title, but file may be named "S01E01 - Pilot" for example). All this is only possible with manual lookup. 22:39:34.245 T:1400 WARNING: CUtil::SplitParams(TVshowPath,"S:\Media\TV Shows - Local Only\Arrow\") - end of string while searching for ) or "
22:39:36.556 T:4424 WARNING: Previous line repeats 2 times. Not related to skinhelper, sounds more like an issue with your PVR addon. Also the second error is spit out by the Kodi scraper, not skinhelper. Ok, so that might not be related, but the problem with multiple eps shown is still there. Sorry I dont know how else to help...there is nothing in the log..
Is there any other info I can provide you to help out with sorting this out? resultats are same in kodi. (2016-12-03, 06:29)wheatfield Wrote: [ -> ] I only got it to work by using manual lookup and ignoring the active filter warning. When the keyboard dialog pops up, it is only displaying the first word of the title, so I type in the rest. I guess I'm not understanding how the filters work. The folders are named like the title of the movie or tv show, though there are episode titles for the actual episode recordings in the folder. Please give me an exact example of one of your grouped recordings, so the title of the grouped folder AND one of the titles of the underlying episodes. Also notice that your naming convention is most probably causing the issue. You named it "S01E01 Pilot", there should be an tvshow title in the filename becaus ethat's what's used for lookups. A lookup for S01E01 will return exactly nothing. Are you aware that you're using "c:\Kodi\Music\" as a custom path for the pvrart ? Can you please test without the custom folder in the addon settings ? I found a small bug where it completely skips the online scraper if any artwork is found in the custom folder. I will fix the bug now so you can also wait for next version. Please see why have that "point" (.) in "artutils.get_tmdb_details...home.."
Only stay isue with tvshow (TVShow have in my library) in pvr dont have info from scraper. (2016-12-03, 14:35)Angelinas Wrote: [ -> ] Please see why have that "point" (.) in "artutils.get_tmdb_details...home.."
No, that's not related, you can ignore that. It's just the way how the cache ids are structured, nothing of importance there. Version 1.0.15 of script.module.skinhelper.artutils is now uploading to the repo. That should fix the issues, thanks for testing and patience! It should also fix the lookup isses for grouped recordings reported by others. SkinHelper does not collect information for all music artists in my library. SkinHelper takes only SkinHelper.ListItem.Art.Thumb and SkinHelper.ListItem.Art.FanArt. Musical artists (for example, AC / DC, Alicia Keys, Ariana Grande, Avril Lavigne, Britney Spears, DEV ..........) have in their catalogs files banner.jpg, fanart.jpg, folder.jpg , logo.png and extrafanart folder with files xxxxxxxxx.jpg, but SkinHelper takes only SkinHelper.ListItem.Art.Thumb and SkinHelper.ListItem.Art.FanArt. Maybe someone can help? What am I doing wrong? Quote: It's working correctly on my setup with those exact same settings. Also supported is an additional "disc" subfolder in the album. Yes, I have the same structure of catalogs for music. Quote: Any errors in the logfile ? 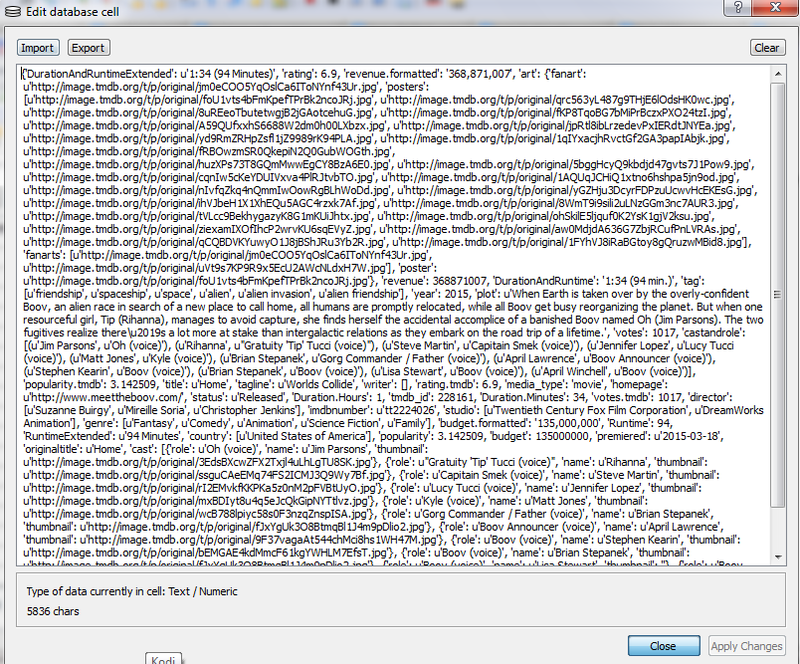 At logfile there is no errors for SkinHelper. You function always analizing only first artist folder at custom folder and give back empty string. I think your code is wrong. If you find a litte time, check it please. Thanks for the catch and the help. There was indeed a stupid error in the code. The fix however was a little more complicated than your change because it should be recursive. I have just fixed it. Do you mind testing it in the next update ? I will put it on the repo later today or first thing tomorrow. (2016-12-03, 14:14)marcelveldt Wrote: [ -> ] Please give me an exact example of one of your grouped recordings, so the title of the grouped folder AND one of the titles of the underlying episodes. Also notice that your naming convention is most probably causing the issue. You named it "S01E01 Pilot", there should be an tvshow title in the filename because that's what's used for lookups. I figured the naming of the episodes was incorrect, I'm just sort of stuck with how the pvr names them. But I thought that I'd get images for the folders themselves since it's the title of the show. There's some additional debug information at the top of these screencaps. The artwork that is displaying is coming from the pvr itself, but it's really limited. Got this error when opening an album. My code after testing works good. If you find a little time, check it again please.